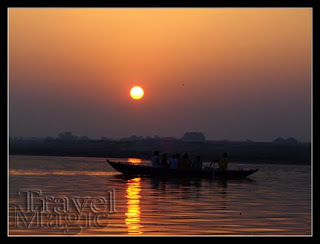 Magical sunrise in Varanasi was the price for 14 hours journey by bus from Khajuraho. It was comfy government bus with proper seats, but still 14 hours is 14 hours. I got in just in time to get down to the ghats and get a boat to see a sun rising above the river. Absolutely spectacular meeting with the holy city. My boat headed towards the sun reflecting in the Ganga, alongside temples and bathing ghats. Soon we reached the Manikarnika burning ghat. One of two, where the bodies gets burned in Varanasi. The other one use electric, but Manikarnika is old wooden burning. Ritual surviving ages. The view of sun across the river and burning ghat on the other side were very impressive. This ghat operates 24 hours a day and it burn each body for three hours. In average, 50 - 70 bodies a day are processed here. Body itself is first bathed in the holy river and then it goes on the wooden file. It cost around 5.000 RUP (minimum), but goes 10.000, 15.000 easily, to get burn in the traditional way. They use 4 kinds of wood - Santal, ... What reminds goes to the river - abdomen for women and chest for men don't burn completely. Also ashes, some bones, ... There are 6 exceptions where the burning is not allowed. In this case the body goes directly to heaven - it is thrown as it is, with stone to sink, to the river to dispose. 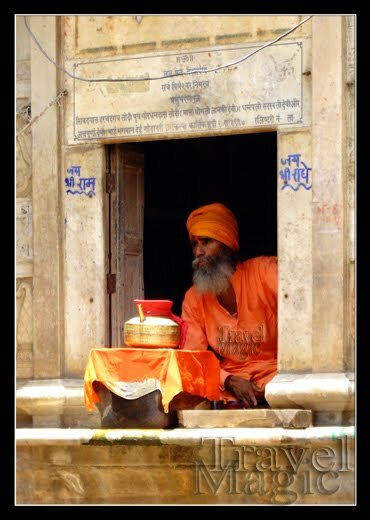 There is a constant fire burning on the ghat (comes directly from Shiva), which is here for lighting the bodies. There are no matches or lighters used. 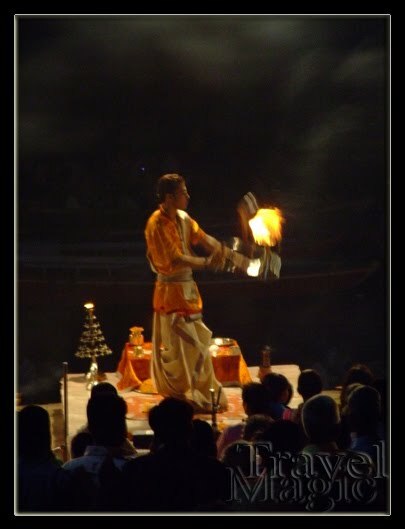 This holy fire is considered to be descended from Shiva and burn constantly in the past 7.000 years. On the way back I rowed the boat and my boatsmen took me to see more. There was a biggish patch of stuff gathered in the quiet part of the river (picture under - taken later from distance). FLOATING SADHU, BABY AND PIGLET - that's my introduction to a mystery world of the spiritual life here. While rowing the boat the old corpse of Sadhu has appeared. You can still see part of the orange sari wrapped around the rotting body. Soon after a small package appeared, wrapped in red cloth - "that is baby" commented my boatmen. Final step took well preserved piglet. It was so swollen it floated on the top as a balloon. For me - it's rather sad to see anything thrown into the river, where many people bath, drink water, live nearby, ... Though I myself am much to pragmatic. I do not find dead upsetting. It makes me remember inevitable part of the life. Indian people has definitely much different approach, but for as "modern people" it is something we are not use to, we are too scared off. One would say, river Ganges is so dirty. Could be, but considering what actually goes in it - and this mean everything - I find it surprisingly clean. Ganga, holy mother, life and death together. How many lives and deaths you have already seen. This city is considered to be thousands years old - the oldest city in the world. What floats here? Everything you can/cannot imagine! Varanasi is a lovely place. It would be easy for me to stay here very long, but I am getting myself to move around the India, to see more places and one day may be return for longer to my favourite ones. 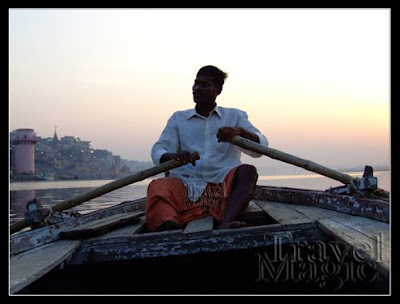 I will leave for the Haridwar tomorrow morning, after staying in Varansi for 5 nights. Highly recommended "Ganpathi Guest House" situated near the Main Ghat. 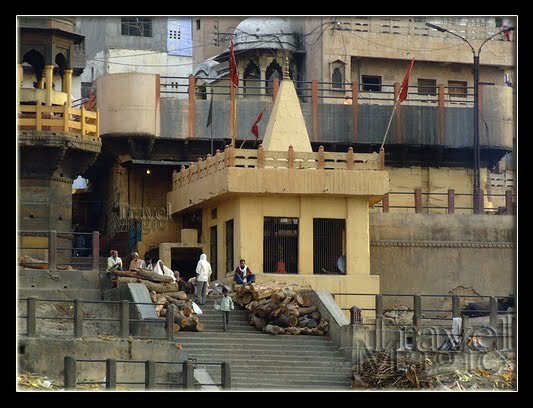 You can get there easily walking from Dasaswameth Ghat (main ghat) towards the Manikarnika Ghat (burning ghat). People there are very friendly and it has a great view on the river, huge rooms, restaurant and it is so close to everywhere. I will also remember this city for its sweets. 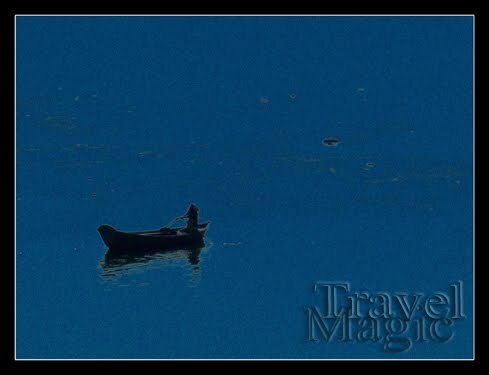 I have tried a plenty of them here and I have to say: "It is hardly anything better than a big glass of milky tea with biscuits or sweets on the terrace of the Ganpati guest house, watching the Ganga underneath!" Manikarnika Ghat is my favourite place. I can seat there for hours watching "the reality of life". Yes, Maya dies at Manikarnika and Ganga is the mother of new life. Fire and water here together create a perfect harmony. 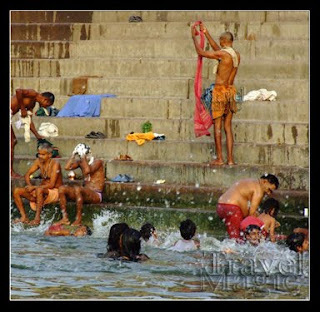 Every evening a big puja is held on the Dasaswameth Ghat after 7 p.m. Many other small pujas are also held along the river through the whole city. More articles on India here: - "India - Agra (Taj Mahal), Jhansi, Khajuraho,..."